The Analyser is a strange machine comprising a limited capacity Sterling currency adder and five separate counters. On the right of the machine is an abbreviated keyboard (keys up to 5) with a column of keys for shillings, a column for pence, and a column with just two keys for farthings (¼ penny). On the left are the five counters, each advanced by a single key. The machine in the photographs displays the total: £99 19 11¾d. This unique machine embodies two distinct functions within the same small case. 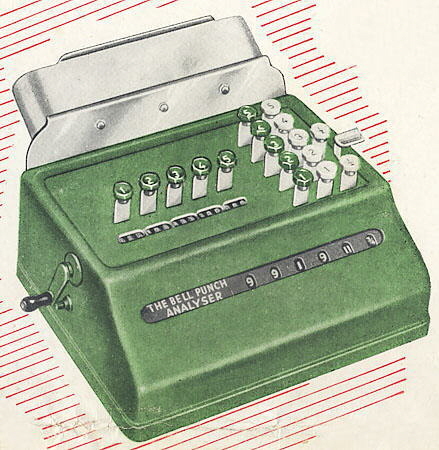 (a) A Rapid Adding Machine which will deal with items up to 9s 11¾. ; and will provide a total of such items up to £99 19 11¾d. (b) Analysis Counters capable of dealing with a five-way dissection of Unit quantities, length, etc. etc. Each of the five Counters will provide a total up to 999. PETROL SALES: With simultaneous analysis of five or less Pumps. VAN SALES: Cash takings, with analysis of quantities to five or less Merchandise Groups. COUPONS: Cash sales , with analysis of coupon denominations. PHYSICAL STOCK CHECK: of Mixed Bin contents; to give bulk values, with analysis of up to five lengths, varieties of or any other required dissection. SALES ANALYSIS: Retail Store Cash Control with Item or Transaction analysis per Department or Sales Assistant. Price £31 10 0. Rental Terms: Five years only, 15/- per month. The Analyser appears to have been sold as a sub-part of the Automaticket ticket issuing system that was called Automacheckit. 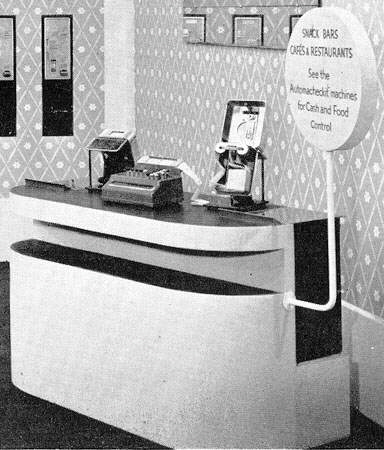 The photograph here shows a Bell Punch Analyser fixed to a counter on a Bell Punch Automaticket display at an exhibition in 1952. See the Automacheckit machines for Cash and Food Control. There appears to be a strip of tickets going through the machines on the counter, including the guide at the rear of the Analyser, which can be seen in the photograph from the brochure, at the top of this page. This is a very specialised machine and appears to be rather rare. Bell Punch News and Views, Vol. IV. Part I, Spring 1952.